This article is about the EarthBound enemy. For other uses, see Starman (disambiguation). Official clay model of Starman from EarthBound. 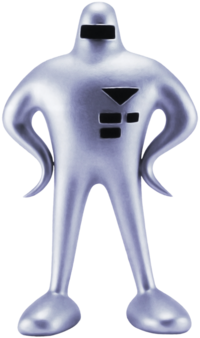 The Starman (スターマン, Starman) is an enemy from the EarthBound series. The Starman's battle sprite in EarthBound. Starmen originated in Mother and later reappeared in EarthBound in several variants, both as regular enemies and as bosses. They are part of Giygas's army in both games. Their teleportation ability is a reference to how they move in the overworld of EarthBound. The "SMAAAASH!!" graphic appearing when a Starman is defeated is a reference to the message which appears in the EarthBound series when an attack deals a critical hit. Ana using PK Beam γ in Mother. PK Beam is a PSI attack featured only in Mother, where it was used by Starmen, as well as Ana. A Starman appears as a trophy. It can be obtained through the Trophy Lottery and the single-player Regular Matches. Just one kooky subset of the diverse cast of enemies in EarthBound, these strange creatures are aliens in the employ of Giygas. Variations of the Starman race include Starman, Starman Jr., Starman Deluxe, and Starman Super. They all use PSI powers, but their strength differs depending on the level on which they're found. The Starman's only appearance in Brawl is as a sticker. An Assist Trophy Starman being hit by Ness. A Starman appears both as a Smash Run enemy and as an Assist Trophy, with the same behavior. It teleports around and attacks with two possible variants of PK Beam: PK Beam γ, which is a single focused beam attack, and PK Beam Ω, which is a barrage of beams in all directions. The beams can be reflected. The Assist Trophy Starman can be defeated, and when it is, it is sent flying with a "SMAAAASH!!" graphic appearing. The "SMAAAASH!!" graphic also appears if the Smash Run version of Starman is hit by its reflected PK Beam, which will also defeat it in one hit. The Starman trophy appears in both versions. In Super Smash Bros. for Wii U it is part of the Mother Series Trophy Box. These alien henchmen serve Giygas, the chief villain of EarthBound. In Smash Bros., the assist trophy Starman will teleport around and fire off PSI moves like PK Beam γ or PK Beam Ω. You can defeat one summoned by an opponent, but they won't go down without a fight. Starmen, the evil Giygas's henchman in the Mother series, are renowned alien space assassins. Summon one in this game, and it'll teleport about, firing off attacks like PK Beam γ, which targets a foe, and PK Beam Ω, which fires across the whole stage in up to four directions. Starmen can be taken out, but...not easily. Starman returns as an Assist Trophy in Super Smash Bros. Ultimate, acting similarly to how it did in Super Smash Bros. 4. Training Mode describes their Assist Trophy: Warps around the stage, firing shots created from PSI. A Starman (right) in Smash Run. The Starman Assist Trophy in Super Smash Bros. for Nintendo 3DS. The Assist Trophy and Smash Run versions use different skins. They use their grey colours from Earthbound as an Assist Trophy, and their white colours from Mother in Smash Run. The PK Beam projectiles look similar to the ones that Ness and Lucas shoots from their PK Fire projectile. Starman was the only new assist trophy in SSB4 to not be officially revealed before the release of the game. This page was last edited on March 6, 2019, at 09:29.